This album “MERCYFUL FATE From the Depths of Hell Red Vinyl” is an unofficial (bootleg) album of this bandof Mercyful Fate. Limited to 500 copies reissue on red vinyl. Classic and ultra hard to find semi official Mercyful Fate fan club recordings. Originally released for a short period in the mid 1980s. Has the same catalog numbers. This entry was posted in Death Metal, Thrash Metal and tagged Mercyful Fate, Unofficial on January 11, 2019 by vinylmeister. 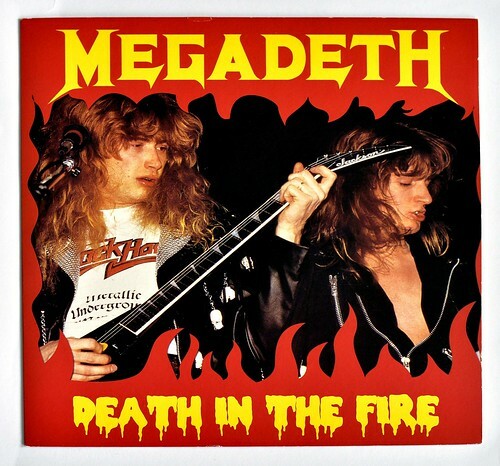 This album “MEGADETH – Death in the Fire 180g White Label Transparent Vinyl” is an unofficial released recording of Megadeth Live in Holland at the Ijsselhallen, Zwolle and in London. The concert of Megadeth on 28 May 1988 at the Ijsselhallen, Zwolle, Netherlands was part of the Aardschokdag (“Earthquake day”) Music festival, other acts included Testament, Flotsam & Jetsam. This entry was posted in Speed / Thrash Metal, Thrash Metal and tagged Megadeth on January 10, 2019 by vinylmeister. Possessed is a Death/Thrash Metal band from San Francisco, California (USA) and was formed in 1983 by Mike Torrao, Mike Sus, jeff Becerra and Brian Montana. During the 1980’s the Possessed Heavy Metal band has released three official recordings on vinyl. This entry was posted in Death Metal, Thrash Metal and tagged Possessed on January 5, 2019 by vinylmeister.